This is a friendly notice that any correspondence and requests to Santa should have been e-mailed by now, or no later than the next day or so — due to high volume and low band width. The North Pole Post Office has been shut down for several years now, and emails, brief and to the point, are de rigueur. I've heard that one of the recent viruses has infected the North Pole website, so even that may be shut down for the season. If your requests aren't filled this year, that may be the reason. 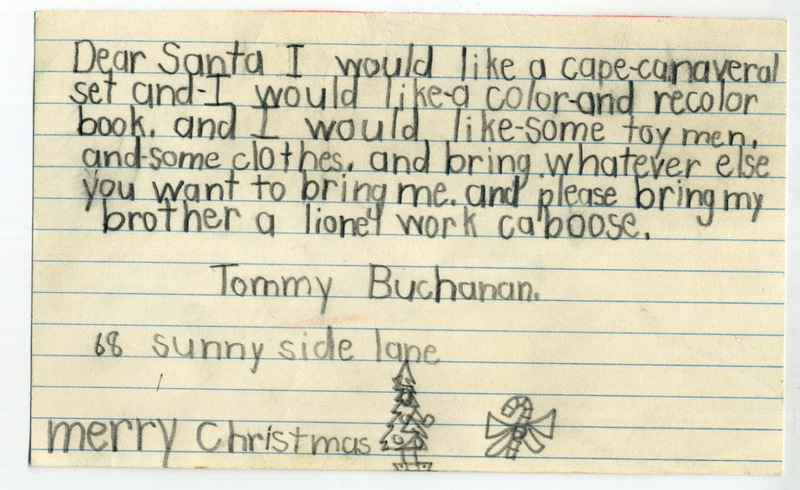 My little snail mail to Santa, shown below, was mailed when I was but eight years old and evidently somehow made its way back to my mother's care, where I found it just yesterday as I was going through more of her papers. Pretty good printing for an eight year old, I'm proud to say. Likewise I'm beaming proud that my requests WERE fulfilled, including the item for my brother, which sits on a shelf display to this day, many many many years later. The Cape Canaveral set — played to death oh so long ago. And I guess I've always liked coloring and recoloring — just ask my clients. ♥ ♥ ♥Soo charming! !My God! !Did you write this...hmmmm..soo nice for a little child! !and bringing your brother a lion!!wow!! Well.I can say living up here in the North.Santa is still alive and working!!! !heh hehe..you just ask him what you want (if you have been a good boy that soo)And he will see too you and family soon..heheh..I know.Iam his secret helper!!hahaha! Wow, Thom. You made me smile this morning. 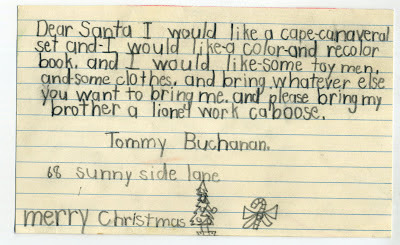 It's a beautiful letter to Santa, and I'm sure it brings tears and joy. Sigh. Childhood, the magic time.